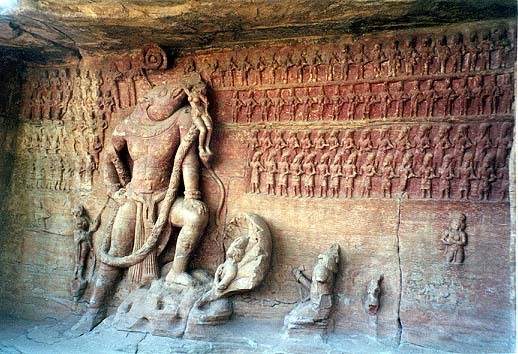 The emergence of Indian art and the sculptures of the gods is discussed in some of the posts below, and is ongoing. It's intense and difficult, and I find I can only take so much of it at a time. It's very conceptual, albeit much of it conceptual about a particular approach to aesthetics (two terms that are often assumed to be contradictory in contemporary discussions about art...). The whole thing hinges on loosely and widely-conceived links between ideas of 'gods, God, man, and nature', in a way that I can't put into words. I perhaps should say, though, that God for me is an idea, not a personal reality. The other strand of work eddies around a fascination for natural forms; fractals, repetition and novelty. I've just written a post on this on the Exploring Creativity blog. In terms of the images, there perhaps doesn't seem to be much link between these two areas. But in terms of the ideas and the feeling, somehow there is. Let's see if I can unravel those links through time and working. There's quite a lot of overlap between this blog, which reflects on the actual paintings I'm doing, in terms of content and intention, and Exploring Creativity, which reflects on the creative process. If you're looking here and wonder why it's been silent for a while, check out the other one! 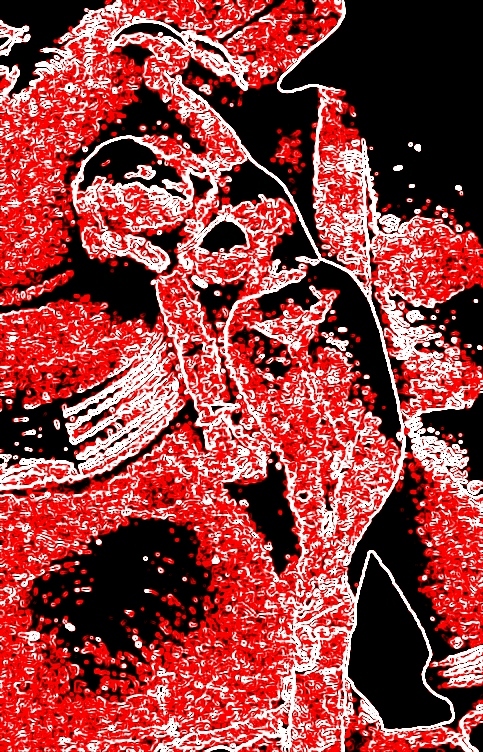 I just discovered some weird new stuff on Picasa, which is the only technology I use in making my digital images. Here is Bhu, the earth, again, in a rather different form! 1. Let us now speak with wonder of the births of the gods - so that some one may see them when the hymns are chanted in a later age. 2. The lord of sacred speech, like a smith, fanned them together. In the earliest age of the gods, existence was born from non-existence. 3. In the first age of the gods, existence was born from non-existence. After this the quarters of the sky were born from her who crouched with legs spread. 6. When you gods took your places there in the water with your hands joined together, a thick cloud of mist arose from you like dust from dancers. 7. When you gods like magicians caused the worlds to swell, you drew forth the sun that was hidden in the ocean. 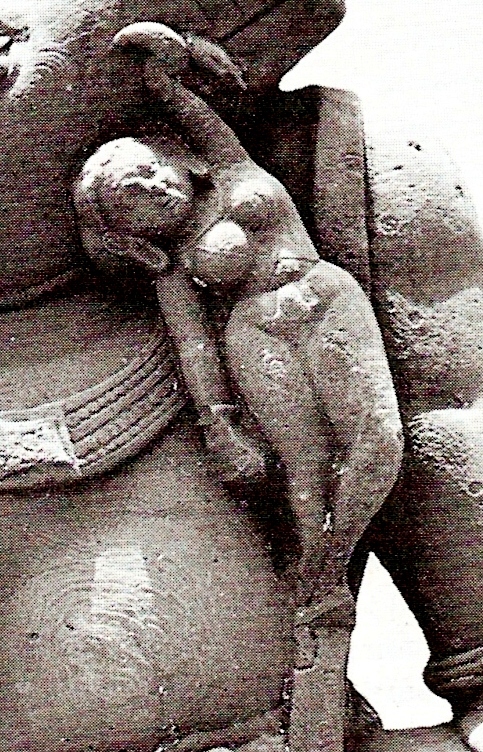 The goddess of the earth at this stage is Pritvi, who has hymns written about her. David Kinsley suggests that ideas about Pritvi suggest 'the awesome stability of the earth itself and (it's)... apparently inexhaustible fecundity'. Pritivi is a goddess, but also the earth in a literal sense. According to Kinsley, 'an underlying implication of perceiving the earth as a great and powerful goddess is that the world as a whole, the cosmos itself, is to be understood as a great, living being, a cosmic organism'. James Lovelock 's concept of Gaia was not the first! This makes me think of Native American writers, who also express the idea of the earth as a living body/being; seeing mining, for example, as desecration. There are other later goddesses who maintain the idea of support and fertility, but the goddess of the earth itself becomes oppressed. That's interesting. And, for me, not just an obscure fact about the history of a distant religion. Here is our earth, in all her beauty and fecundity, in need of rescue. What's ancient about that as an idea? And then, like a sudden summer storm, the wind changes direction. Perhaps a need for a break from the intellectual part of my recent focus on Indian aesthetics; perhaps just something unheard breaking through. The paintings today and yesterday are a theme that keeps recurring. To me, both types of work are completely connected, though they may seem not to be. As I read just a little about the background to these images, questions arise. Who was this exquisite aesthetic really for? Images like this one - and this is true of many of the Chola bronzes - were designed to be carried through the streets in processions. Not only would they have been held high above people's heads, the images would also have been decorated with jewellery and flower garlands. So ordinary people wouldn't have seen their beautiful adornments and serene faces hardly at all. Similarly, the larger bronze images, which look so extraordinary in their dark, backlit display in a museum in the States somewhere, would have been installed in the centre of the temple, and also festooned with clothing and jewellery and flowers. The only people who would have seen the perfect proportions, the beautiful inscribed jewellery, the subtle suggestions of fine clothing, would have been the image-maker and the priest. I don't know what recent academic studies have to say about this, but these fairly unequivocal facts about the use of these images have got me thinking. This aesthetic seems not to have been, ultimately, about pleasing the onlooker. And it also was probably not about individual 'artistic expression' as we might understand it. Although there are times when sculptors did leave their names on inscriptions, and some images that show an aesthetic vision and technical skill that might distinguish one image, or set of images, from another, critics from outside the culture have pointed out that this aesthetic is in some ways formulaic, precisely not individual and 'free'. So who was it for? Why, I imagine someone saying, are you doing these endless drawings of obscure bronze sculptures and carved stone? Do I ask myself that question? Only slightly. I'm wondering how this is different to drawing landscape or figures or making abstracts. It certainly isn't about practising technique (as you might 'practise' drawing real-world objects) and the aim isn't to produce something that will sell, or please others. Drawing and painting these figures is an exploration. Just as trying to draw the human face reveals details and wonders that would have normally been overlooked, drawing or painting here pulls me in to the image, its form, its texture. But then there's more. I'm absorbed into the effect of time on the surface of the metal, or of wind and rain on stone. I notice that the figure I'm drawing is only half completed, its hands and feet still unformed planes, making it almost abstract. I can almost feel the chisel in the hand of the sculptor, feel the hunger in his belly, wonder if he has khol around his eyes. How many of his descendents have woken again and again to a Indian dawn, washed at the communal pump, and set of for a day's work chiselling stone in the intervening 1000 years? The panel is attached to a huge stone edifice that no-one fully understands, at the centre of which there's a small tight passage covered in paintings of dancers, that was clearly not meant for ordinary worshippers. So many mysteries of art and behaviour, leaving only these tantalising trails in the material world of 2012. I have an instinct towards this project that comes out of deep memory and association. It's a project that brings together, unasked, but quite perfectly, a number of different strands of interest and experience. A relationship with the colours, art, people, and land of India, which goes back thirty three years. An interest in ideas and in the philosophical, but the long-standing impossibility of finding a home in 'Western' politics, philosophy or art. A delight in writing and words as a means of exploring ideas. A surfeit of academic words relating to the social sciences, and an exhaustion with the disembodied theoretical. A craving for the aesthetic; for the felt and experienced rather than than the conceptual. An interest in movement and the body as an antidote to these things. After over two years of struggling to return to my painting roots, the unexpected appearance of the Indian dancing human/godly form in my work was a big surprise. For the last couple of months I've been trying to follow this without asking too many questions. I've always been aware, though, that this dancing Indian image (as understood both within Indian textual traditions and within the lives and practices of living, earthly people) was some kind of still point which in brought together many things which are traditionally seen as separate in my own culture. The conceptual versus the aesthetic, for example, or bodily sensuality versus rarified philosophies. Most interestingly of all, for me, was an apparent stress on the primacy of nature - the vastness of the universe, human beings, the smallest flower - which sometimes involved a concept of God or gods, and sometimes did not. It may seem strange to suggest that images of God/gods may not always be much to do with the idea of God/gods at all (at least as these concepts are understood in European and American cultures), especially in the context of traditions that seem to use images of gods and God in their every nook and cranny. But that's part of the intention of this project; to try to open up a space, physically and aesthetically, which questions or reframes what might be understood by words like 'gods', 'God', man, nature - and the separations so often assumed to between such ideas. 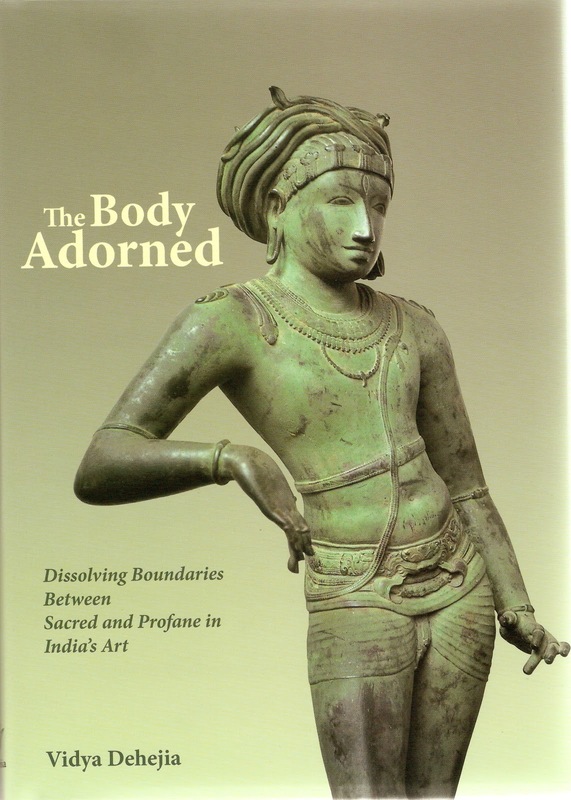 In this wonderful book I've just received through the post, Dehejia talks about ''the extraordinary body-centred literary imagination' found in Indian art and literature. Her upper garment was the globules of foam and her glorious breasts the sporting rahanga birds. Her romavali, effective in distracting the minds of learned men, was the network of algae. Her beautiful ringlets of braided hair were the rows of bees, and her lengthy eyes, the petals of the blossomed lotus. Her navel, dispelling the heat of those with fever, was the whirlpool churned by the wind... Her buttocks were the wide, glistening sand banks. This is a complicated project I've embarked upon. It's a form of art, but not only 'my' art; because it seeks to bring a particular ancient aesthetic into a world that usually doesn't look at these kinds of images. It's unashamedly 'aesthetic', which is unfashionable in the contemporary art world (see the second of Jim Hamlyn's list of 'threshold concepts' in art teaching). But it's also very conceptual, because aesthetics in Indian art (I need to think about the term 'Indian Art' because it covers so many possibilities), at least in many strands of the ancient traditions, was often a highly conceptual business. What I'm doing appears to be about 'Indian Gods', with all their associations of image worship, multiplicity, strange forms, and brilliant colour. And yet actually these gods, and this project, are, for me, both philosophically and personally, a way of thinking about what it means to be human. The multiplicity of gods appear to be separate and non-human with their multiple arms, sometimes multiple faces, occasionally two genders. And yet many strands of the tradition will tell you that this kind of aesthetic form is in fact intended as a way of helping humans relate to the immanence of a single God, conceived to be permeating every atom of the natural and physical world (and thus humans as well). The Indian idea of a single God, however, is at odds with European and American cultural assumptions. Leaving aside the mystical traditions, many Christian-based ideas about God implicitly assume a separation between God and man. A God who is watching you, watching over you, perhaps guiding you; or judging you, holding you to account. There's no such separation, however, in, for example, the Indian philosophical idea of Brahman/Atman, which sees the conscious speck that is the human (atman) as an integral part of Brahman, which permeates everything. I'd better put in a health warning here. Firstly, I'm not currently reading any scholarly works on this subject, but attempting to articulate what sense remains of three years formal study and two field-work-based research projects which were part of my degree, quite some time ago. 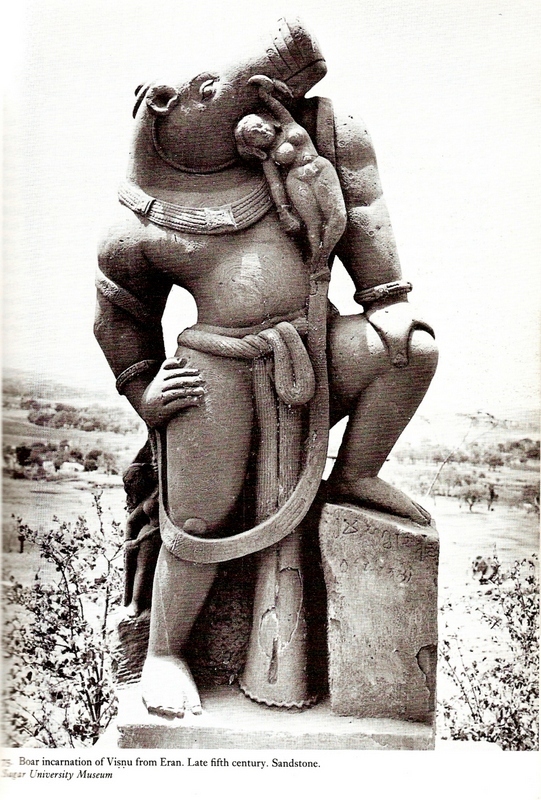 Secondly, any statement that is ever made about 'Indian thought', or religion, or art, can always be refuted - not just by scholars holding different views, but by the tradition itself, which is a composite of multiple different religious, practical and philosophical strands that were never meant to be united into a single coherent thing.